In times past, the countries of the world have been attacked by great sicknesses called plagues. These plagues are illnesses that spread quickly and readily through a population, and are fatal to almost all they touch; where plagues hit, towns are left empty of life and the bodies of the dead are too numerous to count. These times of sickness are now blamed on microbes, bacteria, and viruses, but in the distant past no one knew or believed in these things. Illnesses were instead blamed on such things as bad air, punishments from divine forces, or evil spirits. German traditions in the Odenwald mountains describes plagues traveling through the air as a blue vapor; and one legend claims that a plague which manifested itself in the town church of Erbach as a little blue flame was stopped when it was walled into the church! More intriguingly, many reports come from different places and times of human-like beings that bring the dread sicknesses with them. The earliest such report I know of is the Plague of Justinian from 541-542 CE, when an outbreak of the bubonic plague spread across the whole Byzantine Empire, stretching from Egypt in the South to Italy in the North. During this plague small boats were seen out on the seas by people... boats with headless black men in them. Wherever these boats sailed, the plague immediately struck. Jacob Grimm [1785-1863, one of the two famous Brothers Grimm] tells us that the Greeks of his day described the plague as a blind woman that wanders through towns, killing all that she can touch. Due to her blindness, she walks along walls... so if you stay in the center of a room, she can’t get you. In the sixth century the parish of Elliant, in Brittany, France, was destroyed by plague. Only one man and his mother survived within the area... but tales told to this day claim their survival wasn’t due to luck. The man, a miller, encountered a woman clothed all in white and holding a staff at the ford of a nearby river; she asked to be carried across to the parish of Elliant. The kind man placed her on his horse to help her across. Once they had reached the other side, she told him she was the plague, and that she had just finished one parish, and had now come to Elliant to finish it... but due to his kindness, he and his aged mother would be the only people to be spared. According to a Lithuanian legend, the plague was spread by the pestjungfrau — literally the “plague maiden” — who would thrust her hand through windows and doorways and wave a red handkerchief; the inhabitants of these houses always died of the plague. People shut themselves up within their houses, refusing to open doors or windows... but hunger and other needs soon forced them to open their homes and suffer again. One brave man chose to do something about this situation. Even though he was well supplied with food and could have waited longer than any in his village, he purposely opened his window and waited, sabre in hand. A short time later, the plague maiden thrust her red handkerchief into his home... and he sliced off her arm and took the handkerchief. The man and his family died, but from that time on there were no other victims of the plague within the village. The handkerchief was said to be held at a small church, but where it is now is anyone’s guess. In Russia, the plague bearers were also described as women dressed in white. One story tells of a plague woman who asked a man to carry her on his shoulders through all of Russia; as reward, he alone would not suffer from the illness she brought. The man carried her for a short time; at the first town they reached, she waved her handkerchief and everybody in the town died. They next came to the river Pruth, where the man thought it would be a good chance to get rid of the plague woman. He dove into the river hoping to drown her... but she floated light as a feather to the woodland as he sank to the bottom. Another story from Russia tells that a plague woman named Diuma had laid waste to the land, emptying villages, rendering roosters incapable of crowing and dogs incapable of barking... but the latter animals still growled when they picked up the scent of the plague, even from afar. One day a peasant saw the plague woman jump over a high fence and run up a ladder to escape a pack of dogs. 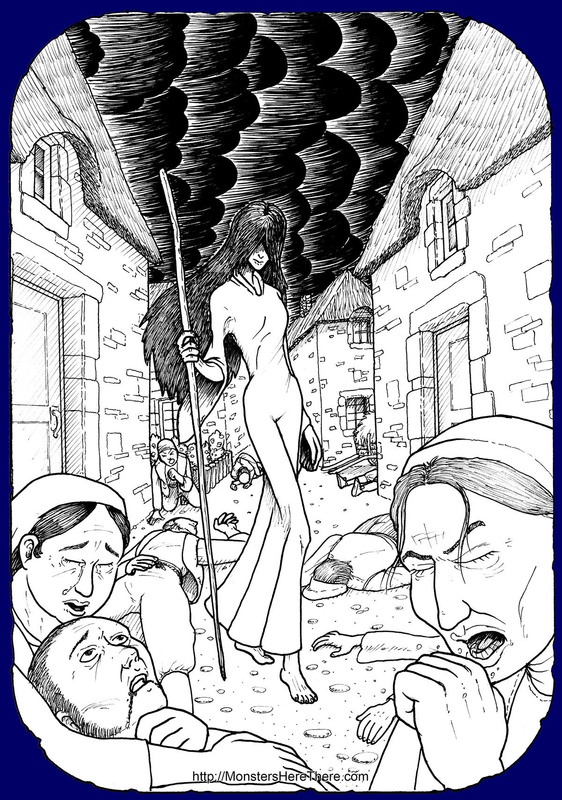 The plucky peasant quickly pushed the ladder over, dropping the plague woman into the pack, whereupon she disappeared. outside around his house naked, and bury the hook under the doorstep; this would prevent the plague from visiting his house. ...but instead of running just around his house, Niebuhr ran naked around the whole village, and he buried his hook in front of the bridge. His village remained safe from the plague, as it struck all the other villages in the area! All of these stories appear to tell us two things. First, the bad news: it does not seem likely that the plague bearers can be destroyed. Second, the good news: these beings do need help passing barriers and getting around, and so can be trapped... and, if you are careful and clever, they can be tricked. Conrad Vallenrod, An Historical Poem, by Adam Mitskievitch, translated by Michael H. Dziewicki, 1883 Thomas Richardson and Son, London, England. Pgs. 122-123. Online: Click here! Teutonic Mythology - Vol. III, by Jacob Grimm, translated by James Steven Stallybrass, 1883 George Bell & Sons, London. Pgs. 1183-1187. Online: Click here!